The geographical and occupational range of Cumbrian communities has produced a wide variety of traditional Cumbrian food.Compared to many other areas of the country Cumbria is rich in its traditional food. The independence of Cumbrian people, their attachment to the landscape, their particular community life and their openness to sea-borne trade have produced this unexpected richness. This richness is found in the variety of daily and seasonal food and in the food for traditional celebrations. Peter Brears, one of the country's leading experts on traditional food and customs, has not only provided a remarkable range of, often forgotten, recipes from the nineteenth centuries, but also provides an original social and cultural history of the county. In Carlisle, in the “hungry” 1840s, more than 6,000 people, over a quarter of the population, lived on under three shillings a week. A poor family could afford oatmeal for breakfast, potatoes and dripping for dinner and a little bread with small beer at a penny a gallon or adulterated tea for supper. 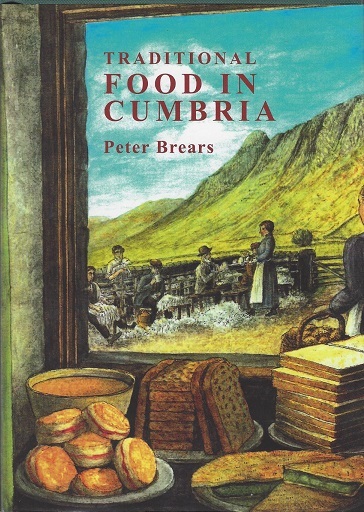 Peter Brears’s account of traditional food in Cumbria is far, far more than a compilation of wonderful (and less wonderful) old recipes, it is a detailed and extended social history of Cumbrian food. The Cumbrian ‘statesmen’ kept sheep and cattle and grew small crops of oats, barley and potatoes. An old rhyme tells of how they had “poddish at mworn / And taties and point at neun” and the poddish (porridge) again in the evening. The better-off might have come home from the fields at lunchtime to a fried rasher and savoury pancakes but Peter’s concern is with the whole culture of food among the ordinary people. And he provides beautifully observed drawings of farm kitchens, of oak boards and hams hanging from the rafters. Each community – the coal miners of West Cumberland, the lead miners of Alston, and the iron communities in Furness – had its own way with the foods available to them. In the towns weekly meals might have included potato pot, savoury hash, boiled haddock, Irish stew or baked herrings. Peter Brears, a food historian of national repute, takes a great relish in the ordinary lives of ordinary people and in the plain, simple food that nourished them over the centuries.